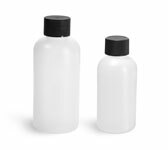 The 1/2 oz size has a polypropylene inner liner and a polystyrene outer liner, while both layers of the 1 oz through 8 oz black double wall jars are made of polypropylene. Click "Add-ons" to select compatible caps or cosmetic disc liners for these jars. These jars are offered without caps. Note:The 1/2 oz size has a slightly more dull finish. A double wall jar is essentially a jar within a jar, appearing bigger than a single wall jar while containing the same amount of product. 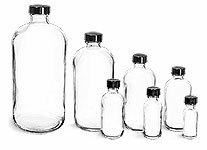 Both the inner and outer shells of the 1, 2, 4, and 8 oz jars are made of polypropylene, a good barrier against moisture, oil and alcohol. While the 1/2 oz jar is made of both polypropylene and polystyrene. Polystyrene is lightweight, hard, and heat stable. Be sure to test your product with these jars to ensure compatibility. The 1/2 oz black double wall jar features an inner layer made of polypropylene and an outer layer made of polystyrene. 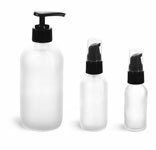 The 1 oz through 8 oz sizes has two layers, both made of polypropylene. All sizes are paired with matching black F217 lined dome caps. 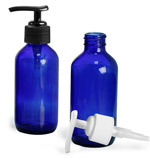 These plastic jars include a round bottom that could be a great option for packaging face, body, and hair care products.